On Saturday last 58 Glenmore athletes represented the club at the Preston Louth Championship at the Bush stadium. On what was a bitterly cold day for the first outing of the track & field season, the 58 athletes did their club proud collecting 25 individual medals and 5 relay medals. 1st up on the track was Maeve Walsh in u8’s . Maeve had a great day winning 2nd in 60m sprint and 1st in 300m. James Murphy ran well in boys u8. Next up was Niamh Cranny, Oisín Gallagher and Jonah Moore in u9’s, all of whom ran well across their events. 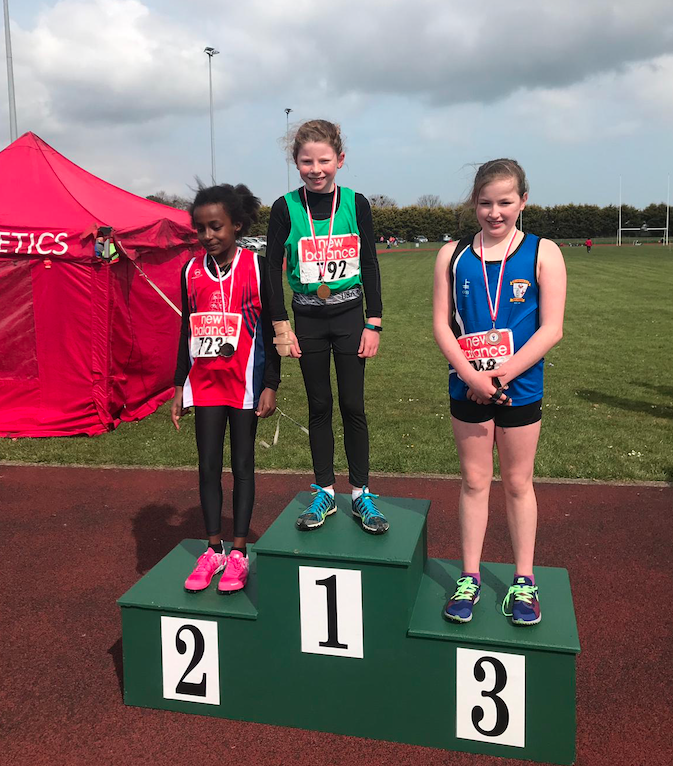 u10’s Anne Finnegan , Holly McCann, Aoife McDonald, Gillian Tuohy, Zoe White and Fiona McIntyre all competed strongly with Gillian Tuohy & Zoe White taking 2nd & 3rd respectively in both 60m & 500m. In u11’s Sarah Duffy finished in a well deserved 1st place well ahead of the ready of the field in 600m. Sophie Cumiskey, Roisin Daly, Sarah Murphy, Lucy Keenan, Ronan Dunne, Liam Holland, Eoin McIntyre & Oisín McCoy all competed well at this age. Another large field of u12 athletes competed across all events with Jessica White taking 3rd in 60m sprint and Elliott Nichols 2nd in 600m. Leah Dunne, Eimear Finnegan, Aoife Keenan, Aine Gallagher, Grace Keenan, Aine O’Reilly, Katie McDonald, Ruby Steeples, Saoirse Byrne, Eoin McCoy, Craig Tuohy, Peadar Walsh, Christopher Conlon, Cian McGee & Ruairi Holland all competed well. u13’s saw Aaron Hanratty taking 3rd place in 80m sprint. Well done to Jake Gilsenan, Sean Holland & Ellen Callan who made up the rest of the u13’s. u14’s had a great day with Lucy White commanding the field in 80m sprint to take 1st place. Ava Ashby ran a great race to take a well deserved 3rd place in 800m. Fionn O’Reilly also took 3rd place in boys u14 800m with Shane Gallagher just missing out on a medal in 80m sprint. Sarah Mallon & Aoife McGee also ran well. 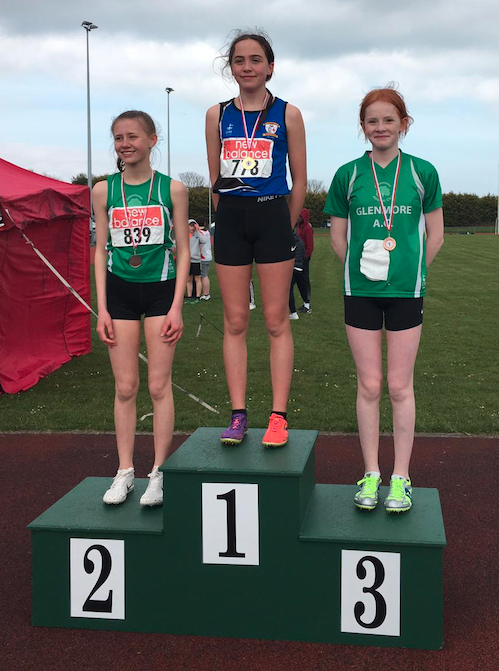 Lisa Conlon was just pipped on the line to take 2nd place in girls u15 800m with Ava Brady following her home in 3rd place. Claudia Mullen also ran well. James Dunne was unlucky to finish 4th in boys u15 100m sprint, just missing out on a medal. 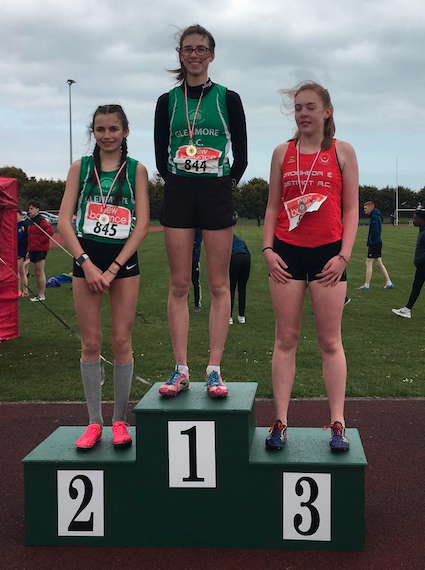 U17 girls performed across all disciplines with Nicole Barry taking 2nd in 100m sprint & Anna McArdle & Zofia Mullen taking 1st& 2nd respectively in 800m distance. U19s finished the day on the track with Anna-Mai Mullen taking 3rd place in both 100m & 800m distance. Ciaran Flynn also took 3rd place in 800m with Craig Kane & Eoin McCann competing well. In the field events James Murphy was 3rd in u8 turbo javelin with Gillian Tuohy also taking 3rd in u10 turbo. Nicole Barry took 3rd place in girls u17 long jump and Craig Kane 2nd in boys u19 long jump. The day finished with the relays. The girls u11 team of Gillian Tuohy, Zoe White, Aoife McDonald & Holly McCann taking gold. Boys u12 team of Cian Magee, Craig Tuohy, Elliott Nichols & Christopher Conlon took silver with the girls u13 team of Ellen Callan, Katie McDonald, Jessica White & Grace Keenan also taking silver. Ava Brady, Ava Ashby, Claudia Mullen & Lisa Conlon took 2nd place in girls u15 relay while the boys u19 team of Ciaran Flynn, Craig Kane & Eoin McCann finished the day with a 2nd place medal. The club would like to congratulate all who took part in Saturday’s event and represented the club with pride. A special word of thanks to all the coaches who continue to prepare the athletes every Tuesday & Thursday evening for the Louth Championships on May 11th. Congratulations to the senior Glenmore AC athletes who took on the Dundalk 10k on Wednesday 10th April. This is a very well organised and supported event and continues to attract many runners across the North East. Well done Kenneth Mc Bride (40:24), Christopher Connolly (42:45), Dara Fagan (54:59), Kevin Carolan (57:47) and Vicky Leahy (01:03:06). Special mention to Kevin as this was his first 10k event to participate in. Our next annual event in our 50th anniversary celebratory year is ‘The Glenmore Challenge 10mile + 10k Road Race’ on the 8th June. This promises to be a fantastic event!